while i love the convenience of store-bought puff pastry, i often only use one sheet + find myself with an extra one lying around. the other day, i found myself yet again with an extra sheet +, after looking around the kitchen, also stumbled across some delicious raspberry preserves. that reminded me of the pepperidge farm turnovers that i loved as a child, so i decided i’d try to replicate ’em at home. awesomely, they only called for 4 ingredients, all of which i already had, so i got bakin’! so, how did they turn out? so very wonderful. i had planned to wait to sample one until my husband came home from work, but after smelling the intoxicating combination of warm raspberries, buttery puff pastry + slightly caramelized sugar, there was no way i could wait – i dug in + devoured one immediately. from the buttery, flaky exterior to the warm, lovely sweet-tart raspberry filling + the crunchy sugar topping, they are simply perfect. 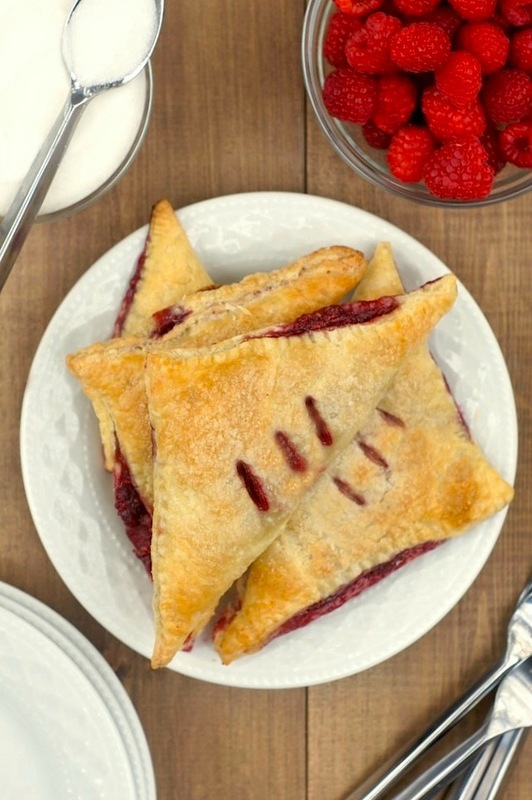 so, if you’re looking for an easy, scrumptious brunch treat or a sweet after-dinner pick-me-up, give these amazing turnovers a try! line a baking sheet with parchment paper or a silpat; set aside. on a lightly floured work surface, unfold pastry sheet; roll out to a 12-inch square. with a sharp knife or pizza wheel (+ using a ruler as a guide, if desired), cut into four equal squares. place on prepared baking sheet; refrigerate until firm, about 15 minutes. in a medium bowl, stir together jam + raspberries. assemble turnovers: after chilling pastry squares, spoon about 1.5-2 tablespoons jam mixture in center of each square. using a pastry brush, dampen edges with water in a 1-inch border. fold dough in half diagonally, to form a triangle over filling. press edges well to seal; with a fork, crimp to make a 3/4-inch border. brush top of pastry with water; sprinkle with sugar. with the tip of a paring knife, cut three small slits in the top (for steam vents). refrigerate until firm, about 30 minutes. preheat oven to 375 degrees while turnovers are chilling. bake until puffed + golden, about 15-20 minutes. some jam may bubble up through vents or out of the sides – make sure you use a baking sheet with a raised edge so you don’t get messy raspberry jam spillage on the bottom of your oven! transfer baking sheet to a wire rack; cool. serve warm or at room temperature. note: unbaked turnovers can be frozen for up to three months; freeze on the baking sheet until firm, about two hours, then transfer to resealable storage bags. bake frozen turnovers on a baking sheet as directed above, without thawing. Oh I just love this!! I loved them as a kid too – the best recipes are always the replications of childhood memories!! Yes! I always have a leftover sheet! Oh, wow. Those look delicious (even though I’m not a huge fan of raspberries)! I want these for breakfast… like right now!!! Love this!!! These are beautiful! I love how easy they are! Yes! I love clean-out-the-fridge/pantry recipes – some of my favorite meals have come from them! Your turnovers look scrumptious! I know I wouldn’t be able to wait to eat one either! seriously, these look awesome. so simple and tasty–anything with raspberries is good in my book. I always have a lingering sheet too! But now I know what I’ll be doing with it very soon! Oh and btw, remember how I mentioned my nap yesterday? Yeah, I napped from 6-10PM. And then slept at 3AM. Raspberries! I wish I could use caps on here because that’s meant to be yelled. Seeing a post containing raspberries in the middle of fall has made me very happy. Thank you. And I’m not familiar with turnovers but they look delicious! I almost always have a leftover puff pastry sheet in my freezer – what a great way to put it to use! My kiddo would love having one of these for a fun school morning breakfast. And let’s face it, I wouldn’t complain about stuffing one of these in my mouth on the way to work. Amy, these turnovers are adorable! Raspberry jam is my favorite kind – it’s SO good on toasted buttered bread. I eat that for breakfast at least twice a week! Anyway, I don’t think I could’ve waited for Kevin to get home to dig into one of these, so I don’t blame you for eating one before he got home. I bet these would be yummy with peach preserves – my second favorite jam!! The best part about making these for me, is that Liz hates raspberries, so i’d have them all to myself!!! Bahahahaha, i love the way you think! Yum, Amy! I love how simple this recipe is, yet it’s gorgeous and elegant! Amy those looks fantastic and so delicious! I would love this for my mid morning snack Great recipe! 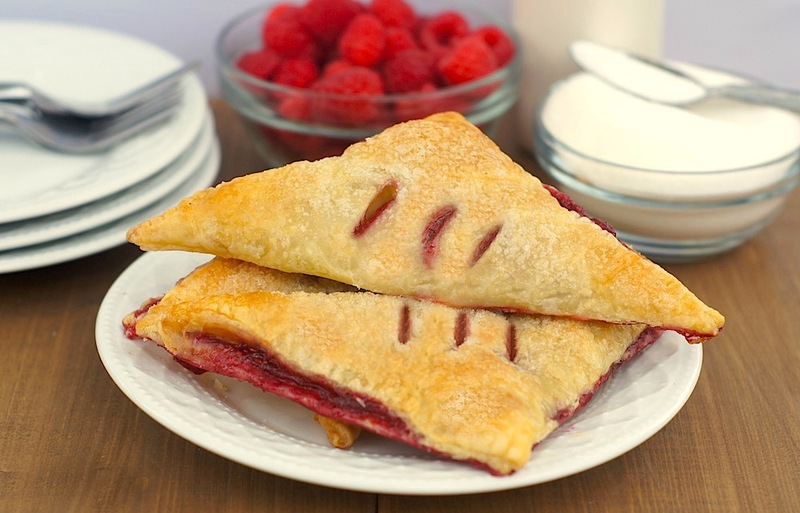 your photos are so pretty – love…and of course the turnovers look delicious…I agree with Erin love seeing raspberries even if it is November! i’ve still never tried puff pastry from scratch but i do want to give it a try sometime! until then, it’s store-bought for me! Oh my gosh, I adored those pepperidge farm turnovers when I was younger!! I’ve made an apple version at home, but never raspberry – these sound fantastic! Breakfast, brunch, dessert… whenever! I want these. Such a pretty filling color too! Eeek! I love puff pastry. You could say, I puffy heart it. Mwuhahah. Anyway, these turnovers look scrumptious, Amy! I love that you added raspberry–an underrated fruit filling for sure! Bahaha, excellent use of “puffy heart.” =) and i will always fight for the inclusion of more raspberry filling in things – it’s my favorite! What a great way to use up a sheet of leftover puff pastry – I don’t blame you for not waiting for your husband to get home! Mmmmmm… these look perfect! So warm and yummy with a hot cup of coffee. I love puff pastry, and I’m pretty sure I could just bake and eat it plain. However, your way of using up a leftover sheet of it looks much more appealing! Oh I love how simple and delicious this is! And they would be perfect to serve a crowd too! Thanks for sharing, A! can you believe i’ve never made anything with puff pastry? must fix this! esp bc i’m obsessed with raspberry jam right now!! oh, you need to explore the wonderful world of puff pastry! it is so versatile and SO easy to work with! I can’t believe these are easy, they look like something I would think was too fancy for me to make! They sound delicious, now I can’t wait to have an extra sheet of puff pastry! Oh Amy! How yummy and so great that it is so easy! I have a sheet in the freezer right now I am going to whip up a batch for Breakfast for tomorrow!!! Thanks for sharing! Oh my. I too use to indulge on Pepperidge Farms turnovers as a kid. I love making my own as an adult now! I love all things raspberry so I’m bookmarking this for the day that I have an extra sheet of puff pastry! Looks amazing! I always end up with 1 sheet of puff pastry too. Same thing with phyllo dough. This looks SO easy and SO perfect! I love anything with jam and YES, I always have that one sheet of puff pasty left over! Yay!! I love raspberries! And I love turnovers. I grew up knowing them only with apple filling, and only later realized the options are endless. But raspberry must be one of the best ever! Definitely have to try this sometime. These look SO delicious! And they are so pretty too! Thanks for sharing, I know what I’m making for a breakfast treat tomorrow! I have made these many times with different fillings. I have some in the oven now with a blueberry filling I made after picking blueberries this past August! Then I will serve with them warm with ice cream! Yummy yum yum.